Properties are classified as either intensive or extensive. Properties are intensive if independent of the amount of mass present and extensive if a function of the amount of mass present. Properties such as pressure, temperature, and density are intensive, whereas volume and mass are extensive. An extensive property may be made intensive by dividing the particular property by the total mass. Total volume (V), which is an extensive property, can be changed to specific volume, which is an intensive property, by dividing by the mass of the system, n = V/m. 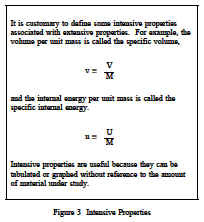 Any specific property (specific volume, specific enthalpy, specific entropy), is an intensive property, as indicated in Figure 3.The use of intensive and extensive properties is demonstrated in the following discussion. Consider as a system 1 lbm of water contained in the piston-cylinder arrangement of Figure 4.Suppose that the piston and weight maintain a pressure of 14.7 psia in the cylinder and that the initial temperature is 60F, part (a) of Figure 4. As heat is transferred to the water, the temperature increases. The specific volume increases slightly, and the pressure remains constant.When the temperature reaches 212F, additional heat transfer results in a change in phase(boiling), as indicated in part (b). That is, some of the liquid becomes vapor and both the temperature and pressure remain constant,but the specific volume increases considerably. When the last drop of liquid is vaporized, further transfer of heat results in an increase in both temperature and specific volume of the vapor, part(c). In this example, temperature and pressure are intensive, and therefore do not depend upon the amount of mass present. By examining the specific volume (an intensive property) of the water in the piston instead of the volume (an extensive property), we can examine how any portion of the water in the piston changes. Volume by itself tells us nothing about the water in the piston. However, by knowing the specific volume we can tell if the water is a liquid or steam.